Come enjoy Sound & Spirit as we unplug for the holidays with "A Winter's View" on Dec. 7th (7pm) and Dec. 8th (4pm) at The Common Street Spiritual Center in Natick center. This will be an intimate candlelight offering that ushers in the holiday season. 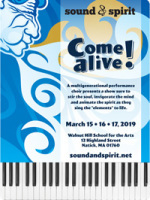 Then prepare yourself for Sound & Spirit's special blend of alchemy and the big bang of a concert: "Come Alive!" our full length concert on March 15 (7pm), March 16 (3pm), and March 17 (3pm) at the Keiter Center at the Walnut Hill School in Natick - as we celebrate the elements of Earth, Wind, Fire and, of course, Water. "Come Alive!" will inspire and engage every generation just as it does our members who range in age from 8 to 80+. From music to thoughtful choreography, through visual arts and the spoken word, the choir presents a show sure to stir the soul, invigorate the mind and animate the spirit as they sing the elements to life. It's a one-way ticket to fun! Sound & Spirit returns for an action packed sixth season, performing its 12th & 13th concerts, guaranteed to delight its members and audience.